Ghana striker Jordan Ayew is looking forward to a new chapter in French Ligue 1 after his move from Olympique Marseille to rivals FC Lorient. The 22-year-old signed a four-year deal with Lorient on Monday after choosing them ahead of several offers to move away from France. 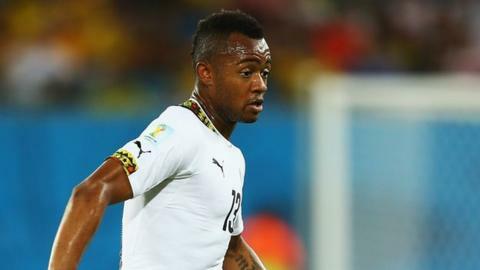 "It was not a difficult choice because this is a fantastic and progressive club," Ayew told BBC Sport. "The club is ambitious and they have a great structure." Ayew, the son of Ghana great Abedi Pele, spent eight years with Marseille but is now looking forward to a new challenge. "The atmosphere is good, the facility is great and you have everything in place to focus on football," he continued. "This is the perfect place for me, and I am really looking forward to joining the squad and continue in this competitive championship [Ligue 1]. "All I want to do is give my best to the club and hopefully it will be a successful time for everyone associated with the team." Ayew, who has 17 caps and five goals for the Black Stars, was part of the Ghana squad to the last world Cup in Brazil. He made a switch last winter by spending six months on loan at Sochaux, where his five goals in 17 matches could not prevent the club from relegation from the top flight. The forward made his debut in 2009 and scored 14 goals in 111 league matches for Marseille, including four goals in 23 matches for them in European competitions. During his time at the club where his father made his name, Ayew won the French league title in 2010 and the League Cup in 2010, 2011 and 2012.